Allergy Advice: Contains Soybean, Gluten, Liquorice. Storage Condition: Store in a cool dry place, away from high temperature and direct sunlight. Ingredients: Vermicelli: Sweet Potato Starch (32.6%), Water. 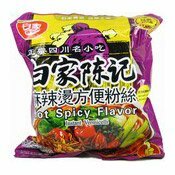 Sauce Sachet: Palm Oil, Rapeseed Oil, Chilli, Broad Bean Sauce (Chilli, Broad Bean, Salt, Flavour Enhancer (E621)), Flavouring, Hot Pot Oily Flavour (0.1%), Fermented Soybean, Ginger, Garlic, Shallot, Pepper, Salt, Spice, Chilli Flavouring (Dried Chilli, Maltodextrin (Gluten)), Sugar. Powder Sachet: Salt, Soybean,Flavour Enhancer (E621), Flavouring, Flavour Enhancer (E635), Dehydrated Green Pea, Sugar. Bean Sprout Sachet: Soybean Sprout, Rapeseed Oil, Salt, Flavour Enhancers (E621, E635), Preservative (E270), Flavouring, Colour (E160c), Acidity Regulator (E330), Preservative (E202), Chilli Flavouring (Dried Chilli, Maltodextrin (Gluten)), Chilli (0.5%), Sugar, Pepper, Yeast Extract, Spice. Kelp Sachet: Kelp, Rapeseed Oil, Chilli, Salt, Flavour Enhancers (E621, E635), Preservative (E270). 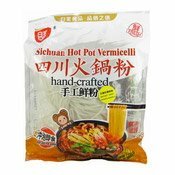 Simply enter your details below and we will send you an e-mail when “Hot Pot Vermicelli (Sichuan) (白家四川火鍋粉手工鮮粉)” is back in stock!